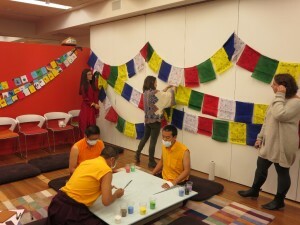 ← A Ganesh Celebration at Family Art Labs! 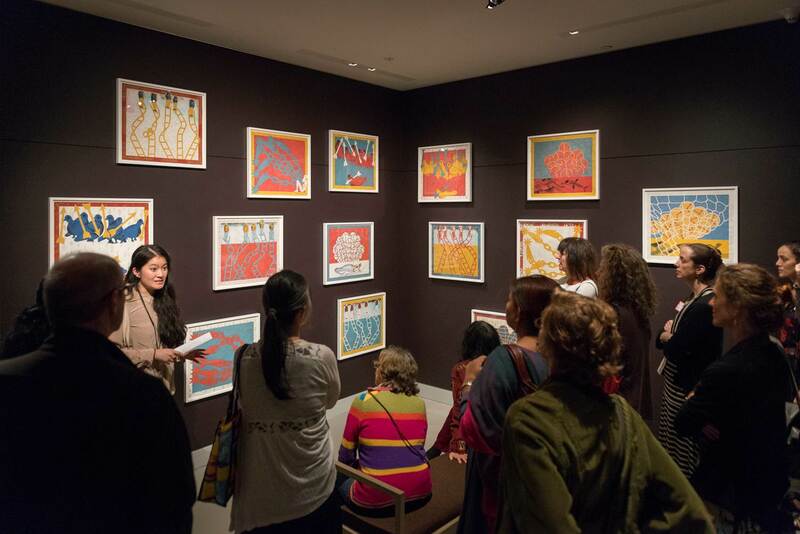 This past weekend, September 19th-21st, the Rubin Museum of Art’s Education team hosted a weekend of open houses for various audiences including K-12 Educators, University Professors, and Families. Throughout the weekend, over 150 educators, professors, and families came to watch three Tibetan Buddhist monks create a sand mandala dedicated to Green Tara, a Buddhist deity and protector. 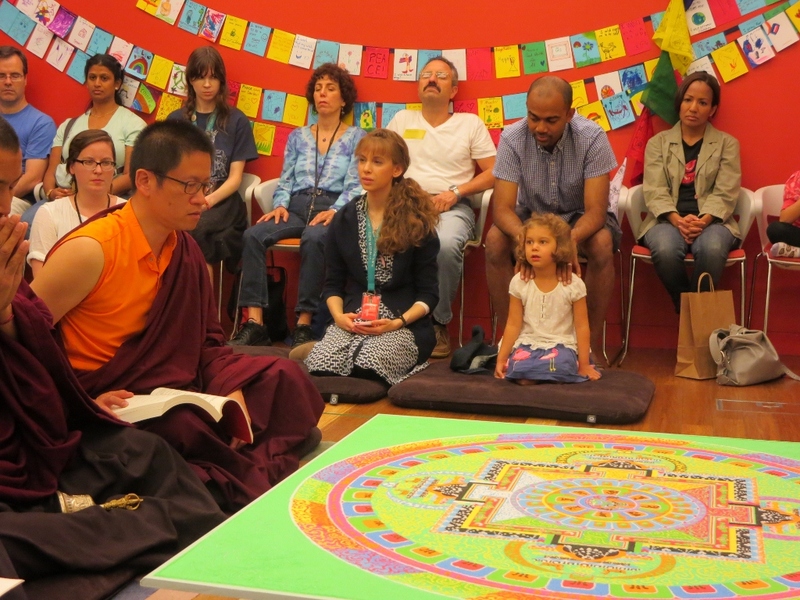 To accompany the creation of the mandala, the Rubin museum’s Education Department presented a series of activities, talks, and tours to demonstrate the many ways that we use mandalas for our school, university, and family programs. Below you can find a recap of the weekend, in pictures. 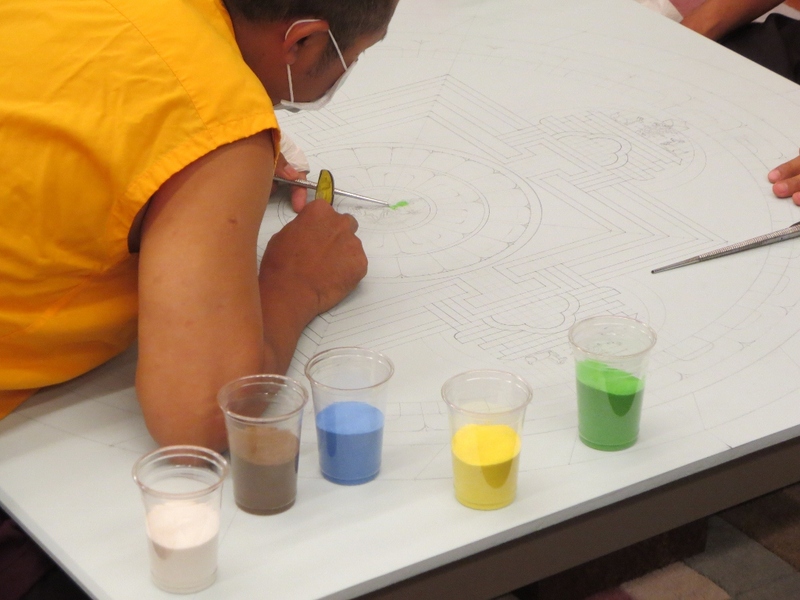 Before any sand was poured, the monks carefully drew out the mandala using rulers and compasses. 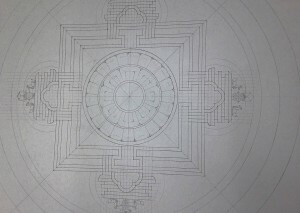 The outline of the mandala could be an architectural blueprint for a real palace, it is so precisely rendered. 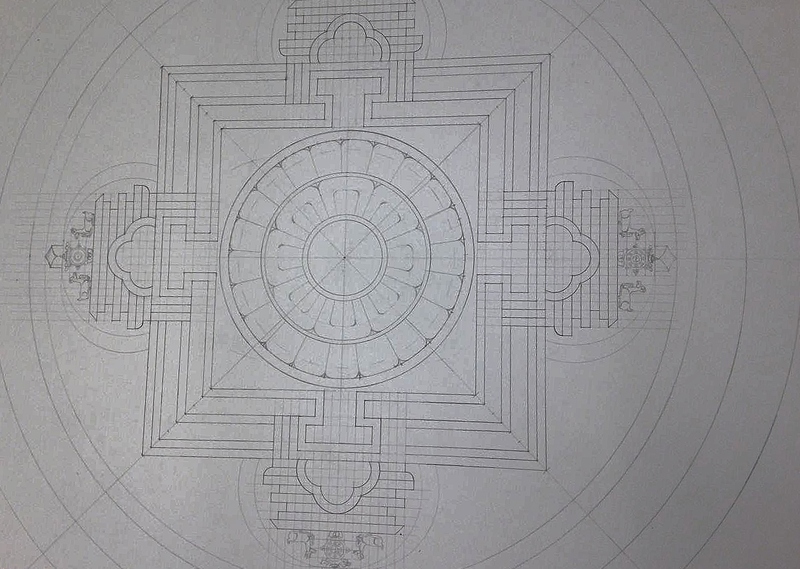 Now it is ready for the sand! 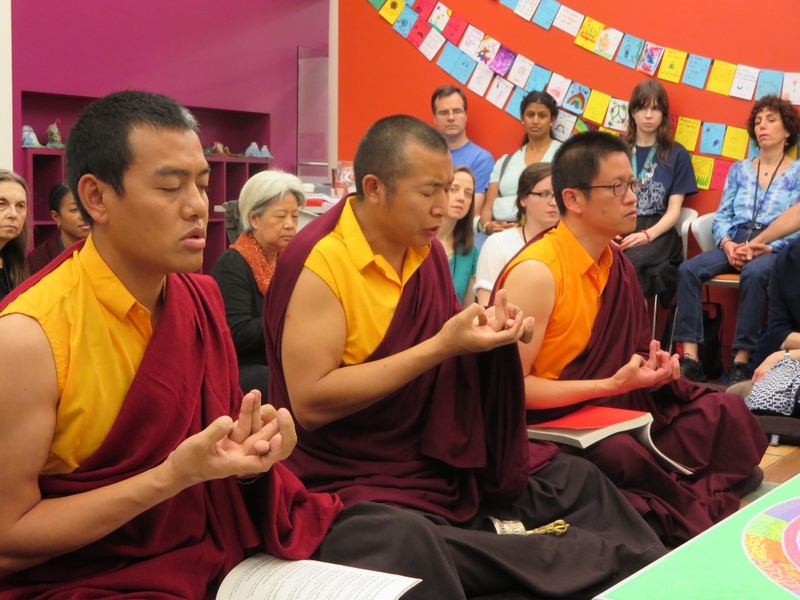 Three Tibetan Buddhist monks from Namdroling Monastery in India prepare to begin a sand mandala while the Rubin Education staff hangs prayer flags. 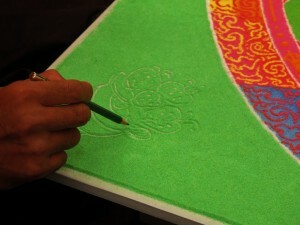 The mandala master puts down the first sand to create the image of Green Tara, to whom this mandala is dedicated. 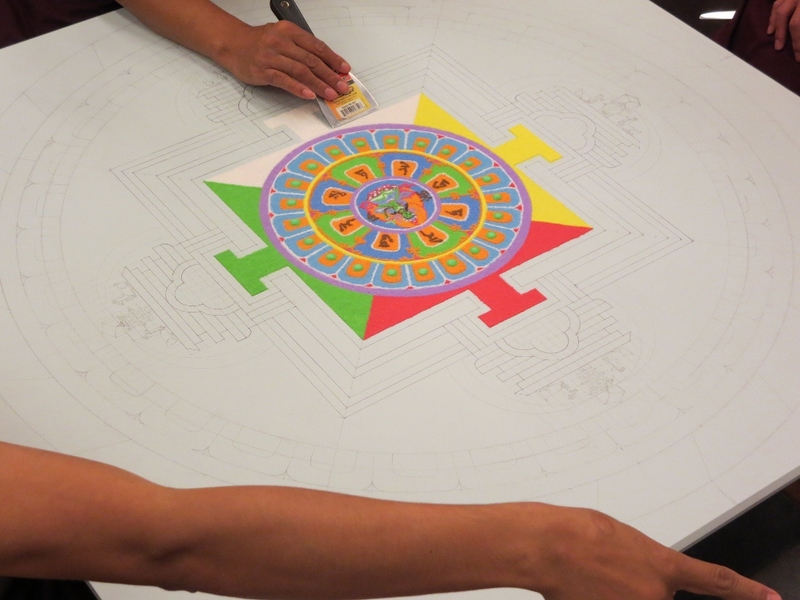 While the monks work upstairs, downstairs, K-12 teachers create their own 3D mandalas. This is one of the Rubin’s workshop offerings for K-12 students. 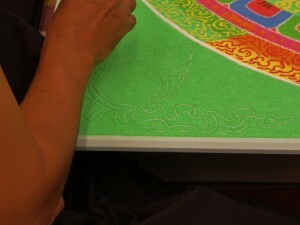 The main colors used in a mandala are red, yellow, blue, green, and white. These symbolize the 5 elements: fire, earth, water, air, and space. To create even richer detail, the monks layer the brightly colored sand to form patterns and add ornamentation. 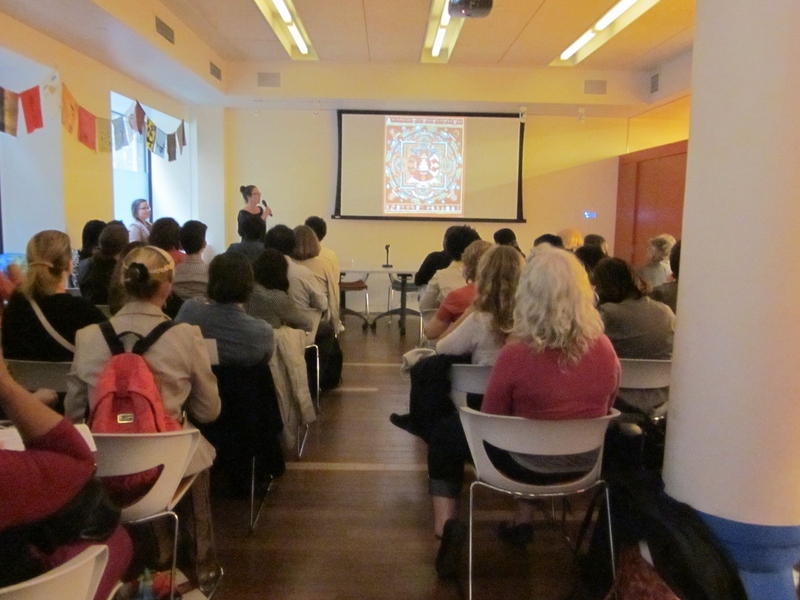 Head of Interpretation and Innovation Dominique Townsend leads a talk on the basic form and function of Mandalas in Tibetan Buddhism for K-12 Educators. Hopefully, many of these teachers will bring their students to the museum for tours and workshops based on mandalas. Tashi Chodron, Coordinator of Adult and Academic Programs, led a Q&A session with the monks. 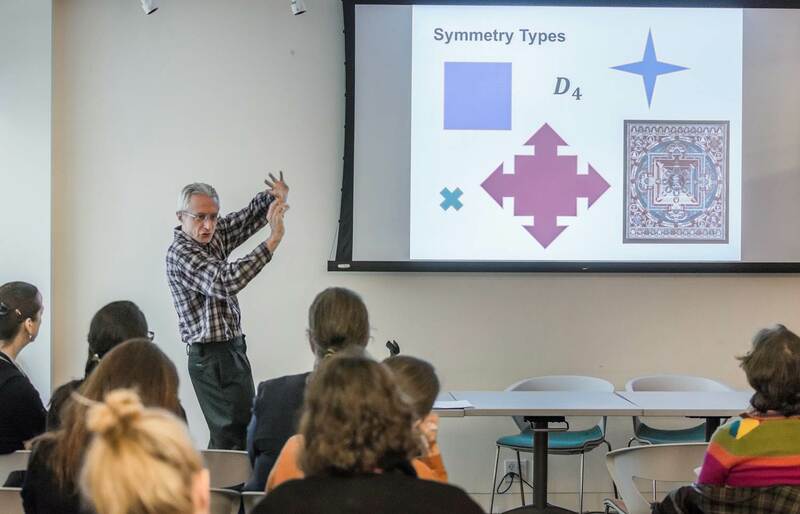 During the University Open House, Laurence Kirby, Professor of Mathematics at Baruch College, gave a fascinating talk about how to teach college students introductory mathematical concepts using Tibetan Buddhist mandalas. As the monks put on the final touches of the sand mandala, some of the youngest viewers remain absolutely still and transfixed. After filling in the space outside of the mandala with green sand, the master incises images of offerings to the senses in each corner. 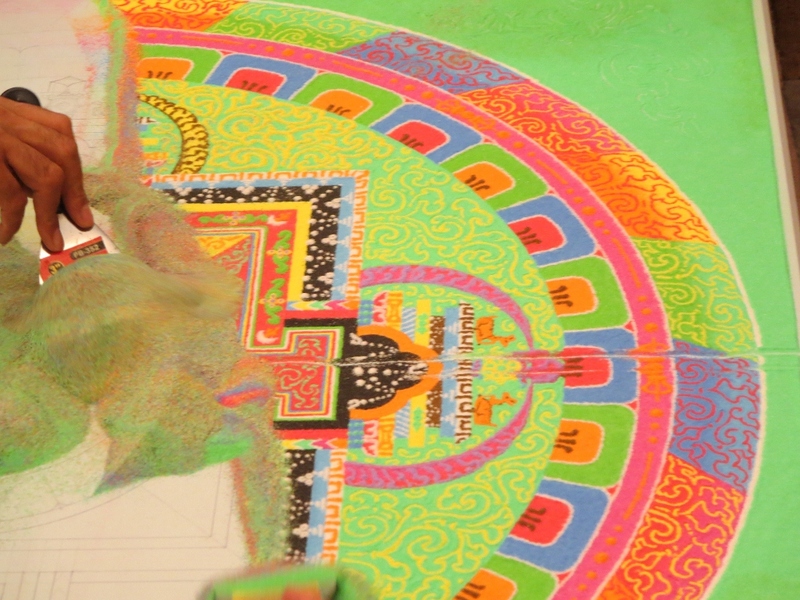 This is a lute, called a dramyin, which is an offering to the sense of hearing. An offering of incense appeals to the sense of smell. An offering of fruit for the sense of taste. 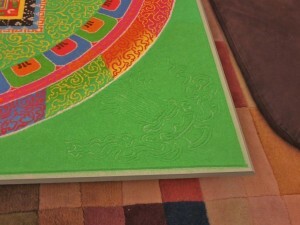 And a mirror symbolizes and offering to the sense of sight. 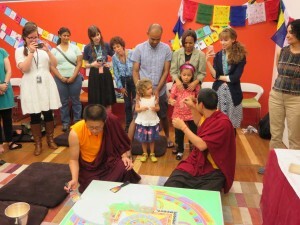 Visitors watch, engrossed, as the monks begin chanting a series of mantras to consecrate the finished mandala before they destroy it. During this final ritual, the monks make many mudras, or symbolic hand gestures. This particular mudra is meant to symbolize a three dimensional mandala. The sand mandala must destroyed to symbolize the impermanence of everything in this world, and that we should practice non-attachment. 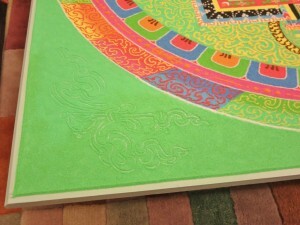 The master monk first uses a vajra, a ritual implement that’s name means lightning bolt, to draw lines through the four gates of the mandala located at each of the four directions. 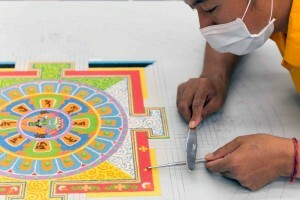 Finally, the monks begin to scrape away all of the sand that they spent 3 days putting down so delicately. The sand is distributed to those who witnessed the dismantling ceremony, which included family visitors, and teachers and professors who had attended the open houses earlier in the weekend. The remaining sand was poured into the Hudson River. 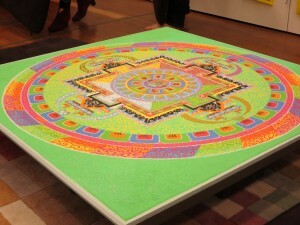 For more information on mandalas, visit the Himalayan Art Resource. Or visit the Rubin Museum’s galleries to see examples of painted mandalas. 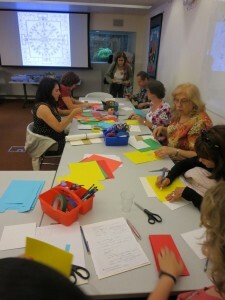 Laura B is the Coordinator of School Programs, focusing on K-12 gallery-based programs, at the Rubin Museum of Art. 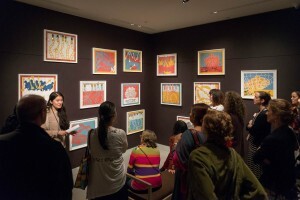 With an education in Art history and an MA in Museum Studies, Laura has worked at various museums around New York City including the Smithsonian National Museum of the American Indian and the Cathedral of St. John the Divine. Laura has found a home in the Education Department at the Rubin and she enjoys the sense of community that the museum engenders among all of its employees. 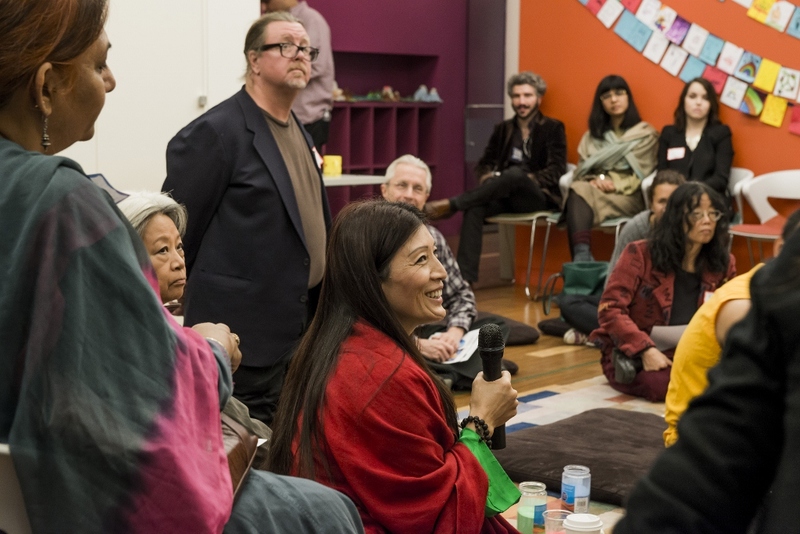 She hopes to continue to grow both professionally and personally while teaching and learning about the art of Himalayan Asia. 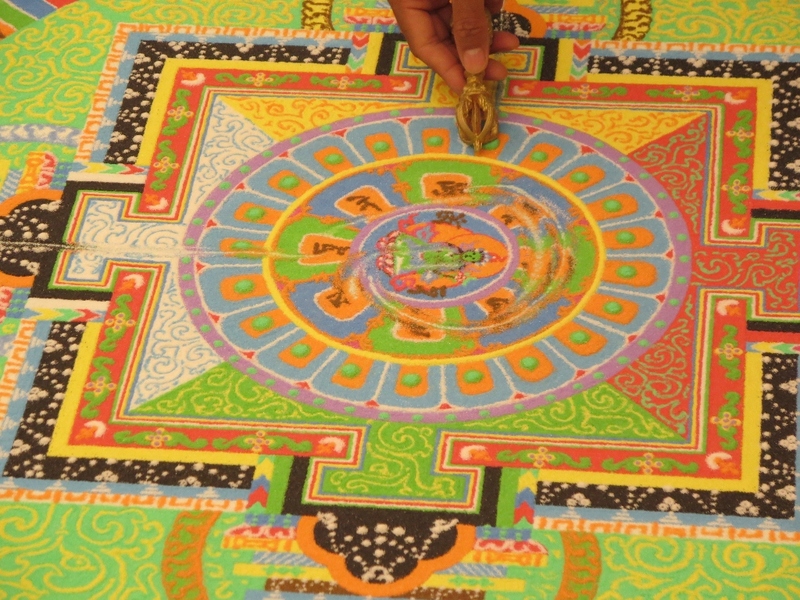 This entry was posted in Art Making, Education Center, Family, Gallery Tours, Himalayan Art, K-12 Schools, Museums, Teachers, Uncategorized, University Audiences. Bookmark the permalink.